What is Shangshui Snack Street? Next to Zhengyang Walking Street, Shangshui Snack Street is a paradise for foodies. You could try a variety of local cuisine and many types of food from other cities around China and even South Asian food on the street. The buildings on the street are in the antique looks. When walking on the street, you may feel that you are back in ancient times. 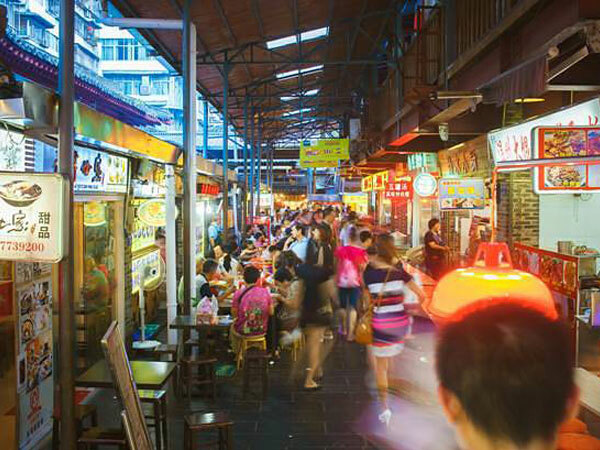 On Shangshui Snack Street, you will be amazed at a variety of food. If you don’t want to visit Longji Rice Terraces, you also can try the tasty bamboo cooked rice here. The bamboo cooked rice is composed of preserved meat, roast pork or other meat with pickled cowpeas. Although pan-fried bun stuffed with pork originates from Shanghai, it enjoys a good reputation in Guilin. You could find it on the street as well. If you don’t want to take in so much fat and sugar but would like to enjoy delicacy, cooked potatoes with cheese will be a good option. There are not only cheese and potatoes, but also diced cucumbers as well as corns in it. Indian naan bread is also famed among locals on the street. Generally speaking, this type of bread is just one layer while Mr. Black Naan Bread (小黑印度飞饼) is two-layer one. The outer layer is light yellow and crisp, and the inner layer is soft and white, slightly sweet. If you don’t mind and have the courage, it is recommended that you have a try at bull offal. It will be more delicious if you add some chilly and bean paste into it. Of course, the barbecue is a necessary and important food on the street and at night markets around China. Surprisingly, there are a variety of baked insects for you to try on the street. Many of the Chinese people don’t enjoy them but they may be popular in some other countries. In addition, there are many local drinks and western food, such as fried rice and meat in a pineapple cut into two halves, and roast beef steak with red wine and much more there. The list of the food on the street is endless. The best time to visit Shangshui Snack Street is from 18:00 on. As Shangshui Snack Street lies next to Zhengyang Walking Street, you could get to Zhengyang Walking Street first and then walk to the street. Take Bus 10, 11, 91, 3, 30, 203, 206, 24, 14, and Bus 18 to the Stop of Liberation Bridge (解放桥站). Then, walk to the street. As at 7th March 2019, it is free of charge. Please take care of your valuables especially in the evening as it is always crowed on the street. Interested in visiting Shangshui Snack Street on a Tour? Wendy Wei Tours offers a variety of different packaged tours as well as custom tours including Shangshui Snack Street, among other attractions and destinations. To find out more, please visit our Tours page or Contact Us directly to find out more.